Nicki Hobday » Day 5. Nuts. And then there were two. One day before the show. But I don’t mean to sound negative because actually these two have been here on time all week and being with them on their own today meant we could really focus. One less person to ask ‘What time is it?’ every 15 minutes for a start. After already having to adapt everything yesterday to make it work with only three of them and then having to do it again with only two felt like a shame but they dealt with it really well, and it just shed more light on how far they have come in such a short space of time. I feel really tired. (In fact this screen looks a bit blurry from underneath my closing eye lids so please excuse any msitake’s). I’d say an early night was in order, but after writing this I need to add to the programme before trying to map out the show and make sure it has some coherence. At the moment the show is a selection of performed fragments of the week. Although it’s slight incoherence accurately represents the process, it doesn’t quite hold together as a piece as well as I’d like it to yet. I’m sure that will happen tomorrow, mainly because it has to, and partly because we should have some idea about who might be performing in it then. We showed Alice and Leo again today, and they gave us some really useful feedback which will help me tonight and tomorrow. I’m sure you’ll be pleased to know that some parts of the outfits I bought yesterday have found their place in the performance, but if any one knows any one with legs the size of an up-to-8 year old who might like some green paper trousers let me know because we won’t be using them. I enjoy writing about the behaviour of the group as much as what worked and what didn’t work in the space, but the two that came today were so hard working and well behaved that there’s not much else to say really. I wonder if they are nervous. They are quite self conscious and occasionally I get a real glimpse of that when they ask about things going wrong or being forgotten. Naturally, I told them that if they get it wrong they won’t just let me down, they will let themsel.. I didn’t. I tried to explain that the audience won’t know what does or doesn’t happen when so all they have to do is make everything look purposeful and it will be absolutely fine. One of today’s questions was ‘what if my brother comes and throws nuts at me?’ to which I assured her that I would simply grab his nuts and throw them in the bin. (They still think I had no idea what it sounded like I was saying which was then almost as hilarious as having to stand on stage and perform but I still didn’t let on). Being in that rehearsal room all day, working hard, thinking harder and enduring one hour of teenage karaoke could be a bit much for the head every day but it’s so close to the sea that a walk along it after is a wonderful way to unwind. That’s what I did this evening. I stopped on the beach for a while and played with the sand, feeling like I should be stressed out about tomorrow but thinking about how glad I am to feel so surprisingly relaxed. But I suppose it is possible to feel chilled out and anxious at the same time. 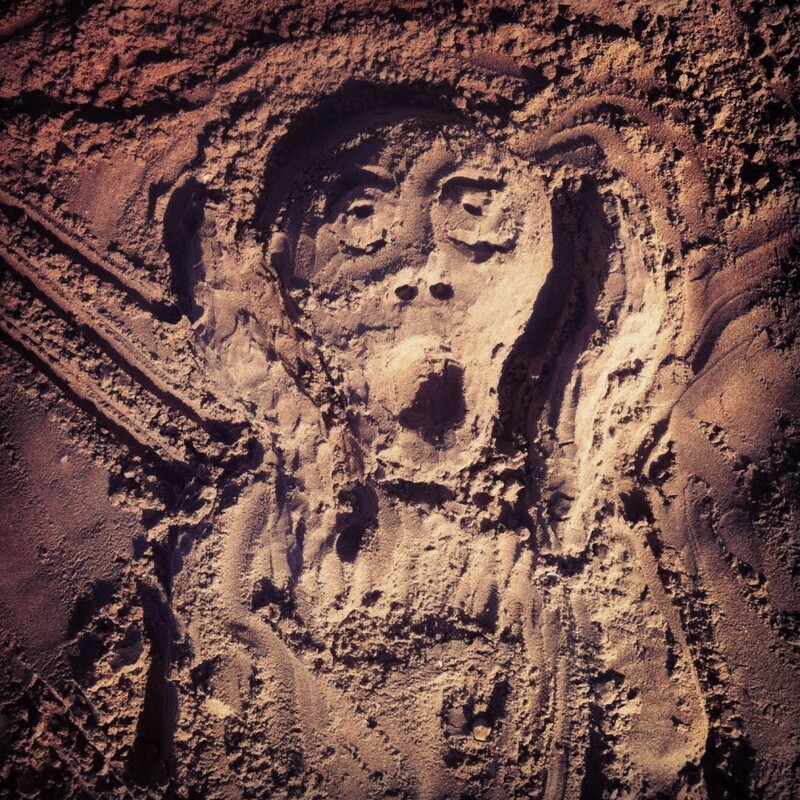 It must be, or I don’t think the mark I left in the sand would have so strongly resembled The Scream.